The “dog days” of summer may be upon us, but retailers are stocking shelves in anticipation of the upcoming rush of back-to-school shoppers. 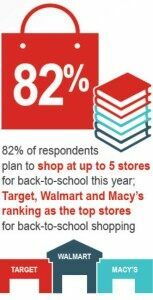 While one quarter of shoppers began loading their carts with pens, notebooks and new outfits as early July, the majority (65 percent) will start shopping in t he next few weeks, according to JLL’s Back-to-School Survey, which polled more than 2,000 shoppers nationwide. The survey revealed that 88 percent of shoppers will shop at a brick-and-mortar store for either school supplies or clothing, placing minimal online orders for merchandise. “Retailers can’t expect to get the customer without creating an experience and providing superior service, but during back-to-school season, it is well-priced and quality goods that drive shoppers. Families armed with lists prefer a ‘one-stop-shop’ to buy everything they need,” says Holly Rome, JLL’s Director of Retail Leasing. As a result of this drive for simplicity, JLL’s survey shows shoppers tend to head to department stores and supercenters that boast a wide selection with excellent values. Respondents indicated their top three destinations for back-to-school shopping this year include WalMart, Target and Macy’s, with 90 percent of consumers expecting to spend up to $500 on back-to-school shopping this year. JLL’s survey revealed that 82 percent of respondents plan to shop at up to five stores for the back-to-school season, and the web plays little part in that plan. More than 90 percent of shoppers noted that when it comes to their wardrobe, they’ll head directly to a major department store, while one third of shoppers indicated that they would not buy back-to-school apparel online this year. Similarly, 45 percent of consumers had no plans to shop online for school supplies; instead 98 percent indicated they plan to visit supercenters for their supply needs. “The back-to-school season is the second most important time of year for the retail industry, following the holidays. Pricing, value and the availability of discounts will make the difference in retailers’ success this fall,” said Karen Raquet, JLL’s Director of Retail Property Services. Cha-Ching is King: The number one factor—across income levels—affecting where consumers shop for back-to-school supplies was price; 70 percent of shoppers ranked it as either number one or two in importance, underscoring why supercenters are so popular for back-to-school merchandise. The significance of low prices should come as no surprise, given that consumers have become increasingly price sensitive since the recession, which is especially true when shopping for commoditized necessities. All About Value: Quality was the second most important factor in deciding where to shop, with 46 percent of shoppers ranking it as a one or two. This trend may explain why dollar stores were considerably less popular with shoppers for back-to-school supplies. This ranking was fairly consistent across income levels and even across budgets. Customer Service and Convenience Takes a Back Seat: Normally brick-and-mortar retailers are focused on creating an experience and differentiation with service, but back-to-school shoppers ranked these two factors least important. While still crucial factors for retailers and owners of retail property, during the back-to-school shopping chaos, value trumps service and convenience. As far as top selections, shoppers surveyed said they typically choose a particular category of retailer with multiple departments and a variety of goods. “Consumers are making multiple trips to compare prices, return or exchange apparel that doesn’t fit, or pick up merchandise that was not available in a specific store,” added Rome. For more information on back-to-school shopping and how the retail industry is faring, please download JLL’s 2015 Back-to-School Survey.